Figure 1 (a) from page 2 of the study: Qualitative estimate of forecast skill based on forecast range from short-range weather forecasts to long-range seasonal predictions, including potential sources of predictability. Adapted by Elisabeth Gawthrop from an original gure by Tony Barnston, both International Research Institute for Climate and Society; edited and reproduced with permission. Long-range monthly and seasonal outlooks have been operational for many years. However, the extended-range timescale, which sits between the medium- to long-range forecasting timescales (i.e. beyond 10 days and up to a season - see Figure 1 (a) ), has received minimal attention until recently. This timescale has in recent years become referred to as the ‘subseasonal-to-seasonal’ (or ‘S2S’) forecasting range, and is generally regarded as bridging the gap between weather forecasts and monthly or seasonal outlooks. Once seen as a ‘predictability desert’, recent advances have been made with at least ten international weather centres now having some capability for issuing experimental or operational S2S forecasts. As noted in a study last year, there is increasing demand for skilful forecasts on the S2S timescale. This interest has been triggered by a combination of growing demand from the applications community, progress in identifying and simulating key sources of S2S predictability, and the recent availability of multi-model S2S forecast datasets such as the WWRP-WCRP S2S database co-hosted by ECMWF and CMA and the NMME. In a recent cross-disciplinary study, the potential applications of S2S forecasts are comprehensively reviewed for the first time. Focusing on potential user applications across a range of sectors, including public health, disaster preparedness, energy, agriculture and water management, the study draws on recent advancements to demonstrate the status and prospects of S2S prediction, highlighting how they can be utilised and where the key challenges remain. The study also shows how social sciences should be integrated with S2S development – from communication to decision-making and valuation of forecasts – to enhance the benefits of ‘climate services’ approaches for extended-range forecasting. The full study by White et al. "Potential applications of subseasonal-to-seasonal (S2S) predictions" was published in Meteorological Applications on 6 April 2017 (restricted access), and can be found here (doi:10.1002/met.1654). The text below captures some of the key messages from the study. S2S prediction is of potentially significant value to society and presents an opportunity to develop a scientific discipline that is characterized by co-design and co-production between scientists and the communities utilising and applying the information. Taking such an approach across sectors and disciplines is key to narrowing the gap between producing S2S forecast information and applying it to real-world decision-making. However, this requires a transformation in the way S2S predictions are conceptualized and communicated by both industry and the weather and climate community. Various efforts are under way to operationalize S2S forecasts in a way that demonstrates their potential value, for example the NOAA Climate Prediction Center’s operational outlooks and the Tropics Hazards and Benefits Outlook. However, there are many decisions that fall between seasonal forecasts and established short- to medium-range weather forecasts, for example forward planning for extreme weather or crop planting. These decisions provide demand for forecast information on the S2S scale, and thus a significant opportunity to provide actionable information. Some potential sectoral uses of S2S forecasts are outlined below, including relevant key decisions and their information requirements. Examples of actionable information that can enable decision-making across sectors are given in Figure 1 (b) below. Humanitarian sector: Reliable longer-range forecasts, particularly of extreme events such as floods and droughts, would enable disaster preparedness actions to be taken in order to mitigate impacts and reduce climate risk. S2S forecasts can support disaster planning and systematic response through enabling disaster risk reduction (DRR) managers to track the progress of evolving (and potentially threatening) climate modes throughout the transition from seasonal outlooks to weather forecasts. Advances in S2S prediction could support the humanitarian sector to systematically react before potential disasters (e.g. extreme weather events), thereby reducing impacts and losses through a better informed early response. Public Health: Public health has been highlighted as a key potential area for the application of seamless weather-to-climate forecasts, since decisions here cover a range of timescales that impact health outcomes (e.g. expected disease outbreak patterns, available medical supplies). This is particularly the case for developing nations, where climate-sensitive diseases threaten millions of people. One of the key likely challenges here may be working with an initially less familiar group of decision-makers compared to other sectors. Energy: Energy pricing, production and usage is intricately tied to weather-related risk. Weather forecasting is already routinely used in many areas of the energy sector, so the development of successful relationships and the integration of S2S forecasting may be easier to achieve compared to other sectors. Forecasts are typically used as input into energy demand scenarios. S2S predictions based on data ensembles are more accurate than the more traditional long-range (10 day) weather forecasts currently used, and could thus be used to better plan for energy peaks and other weather-related energy trading opportunities and risks in advance. S2S forecasts could also be used to manage infrastructure and schedule maintenance, for example on wind farms where work can be stopped (and money lost) during high winds and wave height. Water management: Most international forecast centres use short-range rainfall forecasts to issue flood forecasts and warnings, while many hydro-meteorological centres issue probabilistic seasonal stream flow forecasts that provide 3 month outlooks of total flow volumes. S2S lead times cannot be used to make specific flood predictions but could be ultilized to identify increased likelihood of flooding where stream flows have already been predicted to be high. S2S could thus bring together and bridge these two forecasting communities to provide seamless flood forecasting with longer lead times, with benefits for sub-seasonal water resource management decision-making. Agriculture: Weather forecasts are already used extensively in the agricultural sector for informing the timing of certain activities, such as spraying and harvesting. The S2S timeframe could further benefit the current use of forecasts through supporting early action in the face of weather extremes, for example scheduling irrigation and pesticide application around heavy rainfall events or heat waves. Forecasts on the S2S timescale could also be used to support dynamic updates of crop yield estimates, which could support early planning to alleviate food security issues. Emerging sectors: A number of other sectors could potentially benefit from S2S forecasts, for example fisheries and aquaculture activities, and potentially even the retail sector, all of which are impacted by the timing of seasonal changes. These opportunities need further investigation, and the value of weather forecasts better understood and quantified. 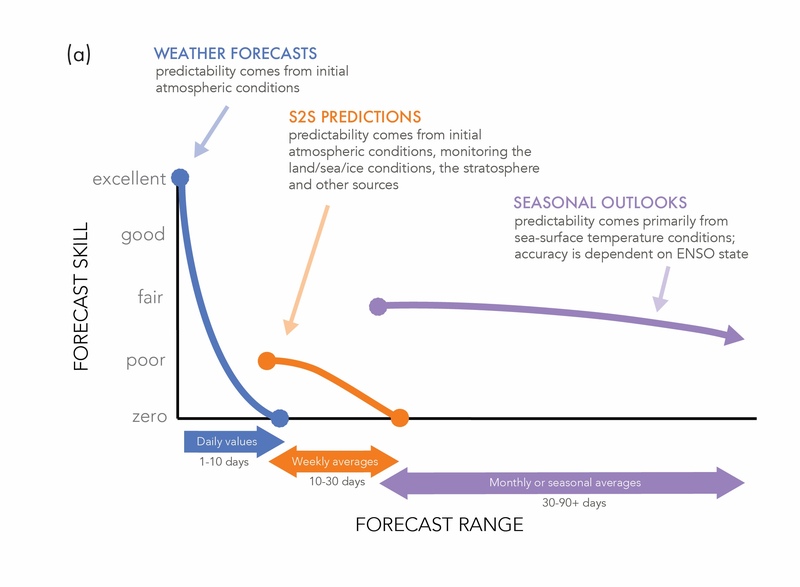 Figure 1 (b) from page 2 of the study: A schematic diagram highlighting the relationship between the subseasonal-to-seasonal (S2S) ‘extended-range’ forecast range and other prediction timescales, with examples of actionable information that can enable decision-making across sectors. Actions are examples only and are not exclusive to a forecast range. Based on Meehl et al. (2001), Hurrell et al. (2009) and Goddard et al. (2014). The utility of S2S and other forecasts is tied to end-user decision-support. Understanding users' needs, perceptions, willingness and capacity to use this information is key to translate it from useful to useable. 'Success stories' are needed to support awareness and uptake of S2S forecasts and its potential uses. In parallel, the limits to the achievable skill/accuracy of predictions at the S2S timescale need to be identified and communicated in order to manage user expectation. The social sciences could play a key role in addressing these challenges through providing a better understanding of stakeholders and the decision-making context, and elucidating best approaches for generating, communicating and integrating decision-relevant information. Increasing awareness around S2S forecasting capabilities presents an opportunity for the weather and climate communities to co-develop (with stakeholders) decision-relevant information of various sectors, to enhance the use of climate information in decision-making. Scientific challenges around improving the predictive skill of S2S forecasts and quantifying their limitations and uncertainties remain and are areas of active research. These include design issues around initial conditions, model resolution, downscaling etc. Addressing these requires increased inclusion of quantitative information around uncertainty and forecast quality with S2S forecasts. The paper concludes that while the uptake and integration of S2S forecasting into decision-making is neither easy nor straightforward, there now exists a growing repository of untapped predictive information that presents tangible and realistic opportunities that can be explored for application-ready capabilities that could allow many sectors to systematically plan on this new time horizon. This study will also be presented as a poster in ‘CL3.01 Climate Predictions - from monthly, seasonal to decadal time scales’ at the EGU General Assembly in Vienna, Austria, 23-28 April 2017.